Over spring break my meals were all about ease. I spent most of my time lounging or working and I was even able to squeeze in a few crafts. This delicious lunch was scrapped together using leftovers from various recipes I had made the week before and it is absolutely wonderful. I didn’t list amounts for the recipe because I kind of mix it up every time I make it. Change things to suit your taste! 2)Heat your olive and sesame oils in a large saute pan. Add the onion, sesame seeds, and red pepper flakes. 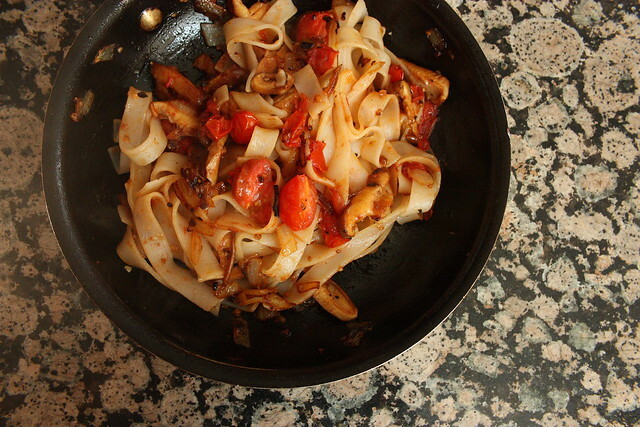 Saute until the onions are soft and the red pepper flakes are fragrant. 3) Add the garlic and saute for 30 seconds. Then add your mushrooms and saute until they are browned. It should take 3 minutes or so. 4) Finally, add the cherry tomatoes. Mix everything up and saute them until they are soft and heated all the way through. 5) Your noodles should be done by now so drain them but reserve a bit of the cooking water. 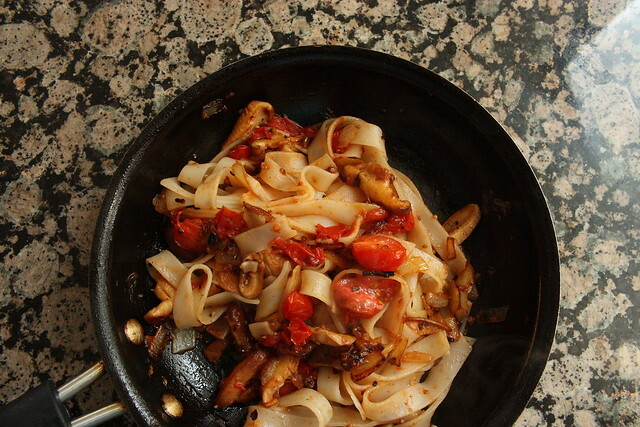 Add the reserved water and the noodles to the saute pan with your veggies and mix everything up.